Ever wondered what it would be like to sleep in a LEGO house? Wonder no more! 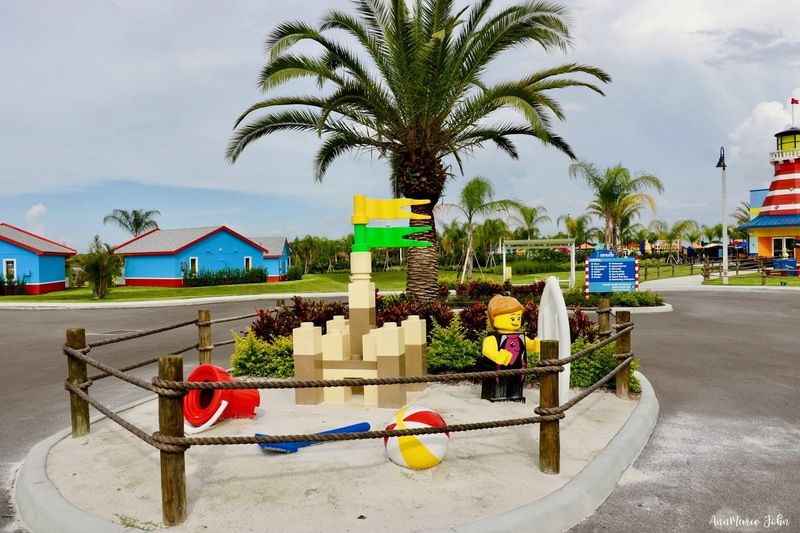 My family and I were hosted by LEGOLAND® Beach Retreat, along with the LEGOLAND Theme and Water Park, while on vacation in Florida for two amazing days. So how does it all stack up? If your family consists of children, more than likely you've played with LEGO sets. Even if you don't have children of your own, you may have played with LEGO's while you were younger yourself. However, staying in a LEGO inspired bungalow is something that dreams are made of. 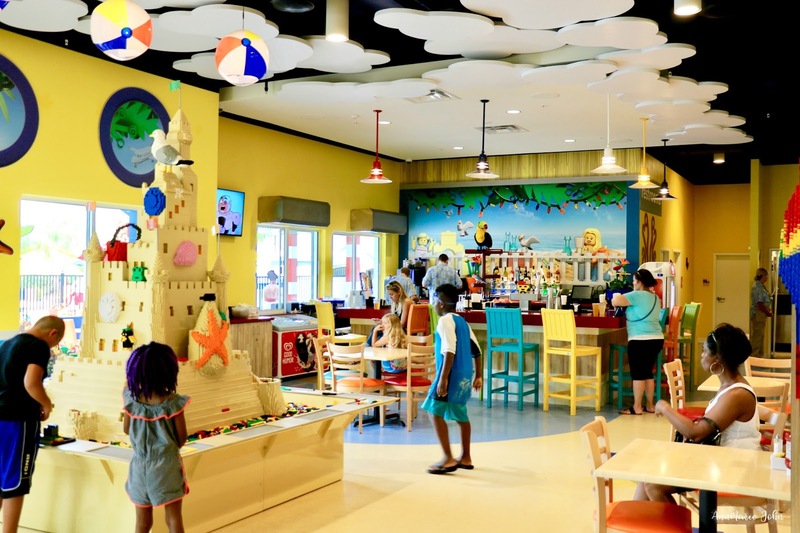 The new LEGOLAND Beach Retreat is just that and so much more. During our two week vacation in Orlando, it rained consistently, but that didn't put a damper on our fun. 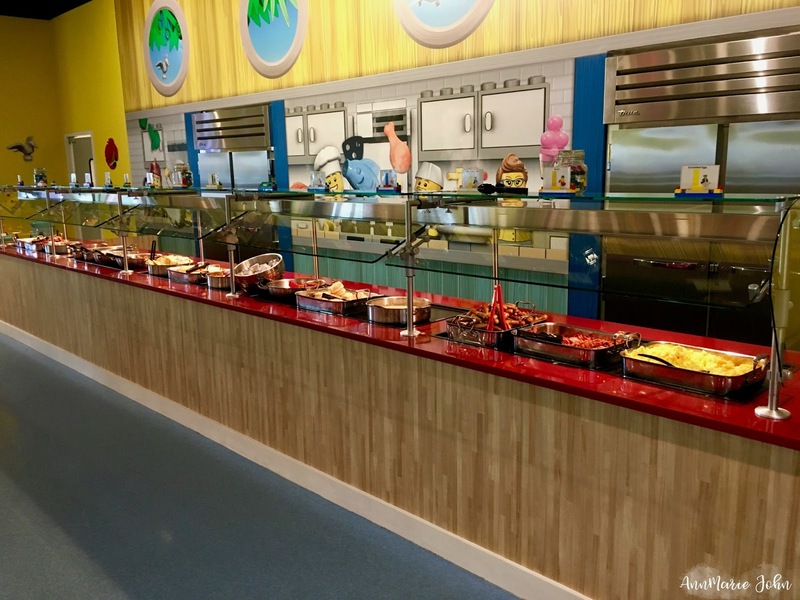 So what can you expect when you visit the brand new LEGOLAND Beach Retreat? 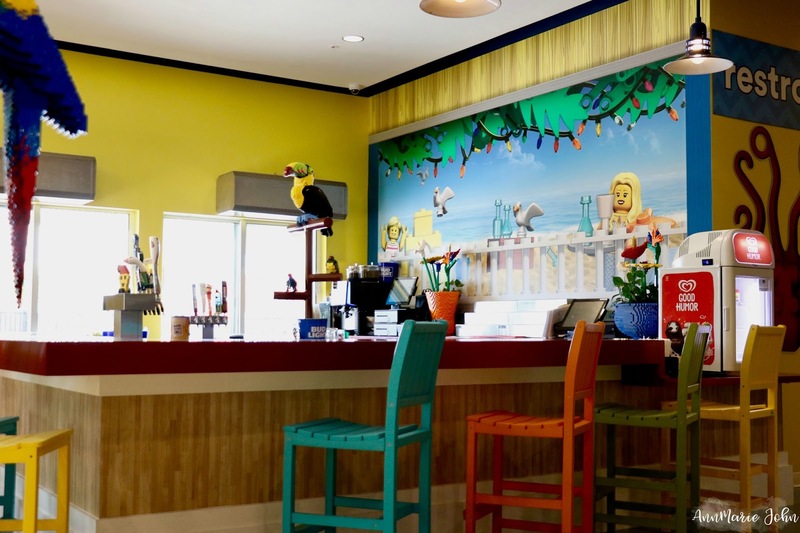 Checking in at the LEGOLAND Beach Retreat was one of the easiest check-in I have ever done. Usually you would park your vehicle, or if you came in a taxi, grab all your gear and go the front desk. 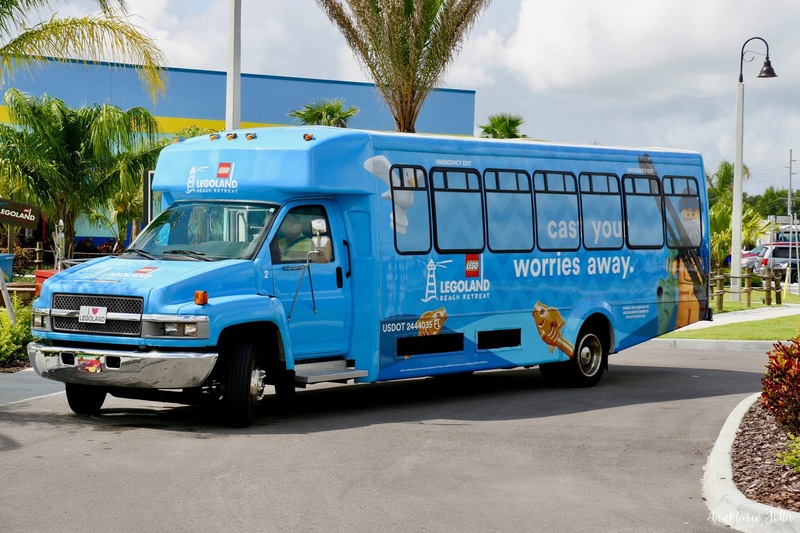 At the LEGOLAND Beach Retreat, you don't even have to leave the comfort of your car. You check in right there at the window where you give your info and your credit card for incidentals, receive your key and a map of the resort, and voila, you're all checked in. No need to drag your tired kids to the hotel lobby and wait in line. Best check-in EVER!!! This was the highlight of the trip. There are currently 83 beach-themed bungalow, with each bungalow being able to accommodate a family of 5. The bungalows are grouped together in a horseshoe shape with a playground in the middle, and views Lake Dexter. Each bungalow also comes with your very own patio area, where you can sit back and relax, while you watch your children playing on the playground, or reading your LEGOLAND TIMES newspaper which is delivered early in the morning. There is also free wi-fi accessibility throughout the Beach Retreat. Each bungalow consists of a King Size bed and a cozy area for kids, which includes a bunk bed, trundle bed and privacy curtain. 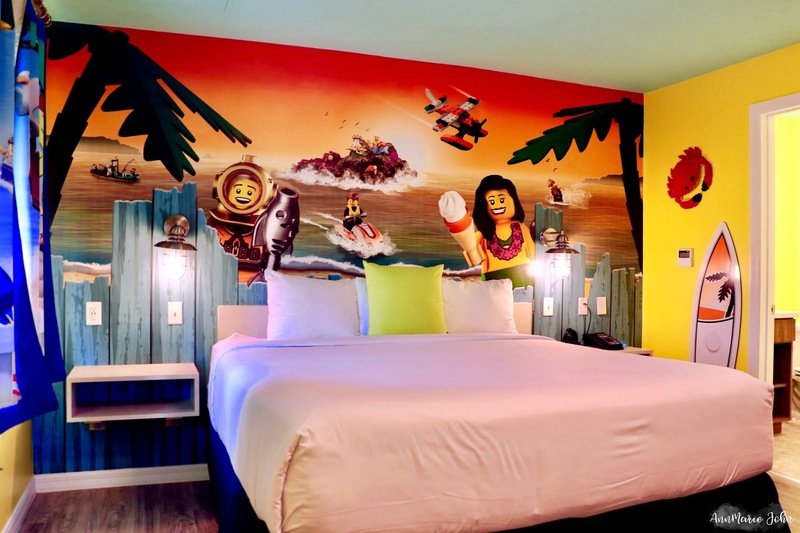 The rooms are also LEGO themed as you can see from the mural on the wall. The kids' room also contained a mural, and I'm not sure why I didn't think to take a photo, I guess I was just blindsided by the awesomeness. There is also a full size bathroom, once again LEGO decorated for all your LEGO needs. You can also find the usual amenities such as a mini refrigerator, Keurig and a safe. The kids were also treated to complimentary water and Honest Kids drinks. There is also a LEGO container filled with LEGO bricks to keep your little ones entertained. 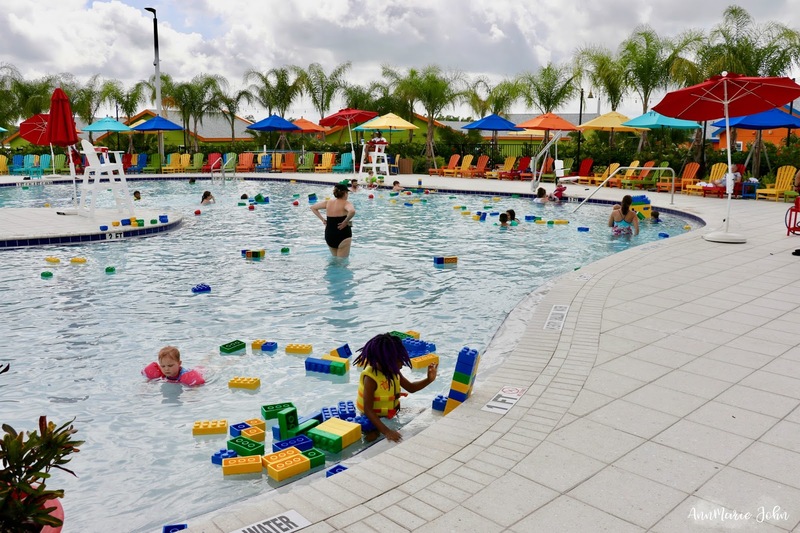 If you think the LEGO Bungalows were awesome, the pool and play area will leave you awestruck! Madison did NOT want to get out of the pool and I don't blame her. The pool was filled with life size LEGO pieces that you can put together. You get to swim amongst the LEGO's. There is also a play structure and a sandy area where you can build sand castles. The pool is open from 7am in the morning until 9pm at night and is always staffed by lifeguards. 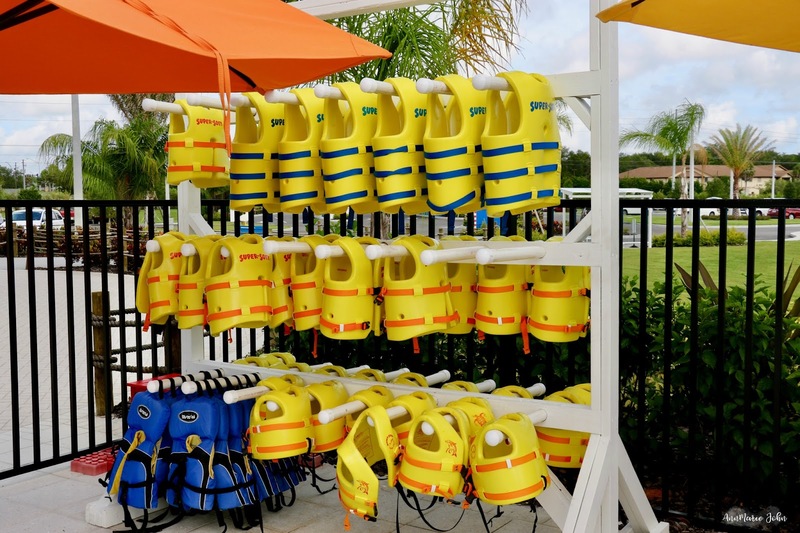 However, there are Lifejackets available for the kids giving parents that extra feeling of security. Parents can relax on the lounge chairs while watching their children play. The fun isn't only for the kids, there are also family activities. At 7pm around the pool area the fun continues. There are dance parties, hula hoop contests and you can even make your own S'mores at the S'mores Pit. 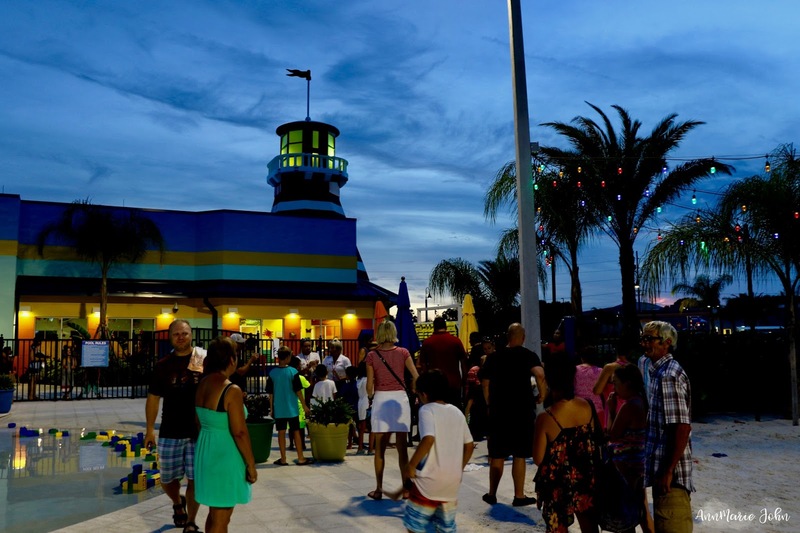 The highlight is the lighting of the lighthouse that shines a real working beacon all around the resort. 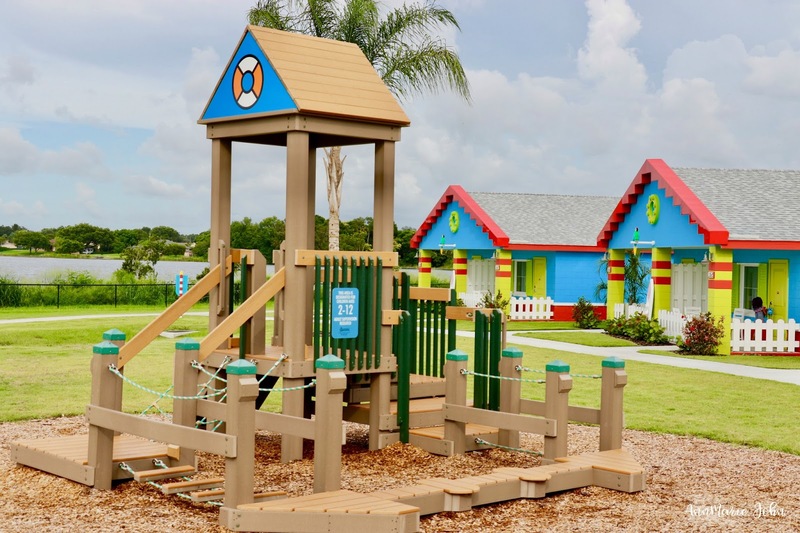 While you may think this is all about family and kids, you may be right, but LEGOLAND Beach Retreat didn't forget about the grownups. I know that after a few hours of being alone with the kids, I need a bit of alone time, and sometimes a drink. Spend some time at the Bricks Beach Bar and order yourself a specialized cocktail. You can have your drinks served either at the bar or at the pool. Breakfast the most important meal of the day, and it's complimentary at the LEGOLAND Beach Retreat at Sandy's Castle Restaurant. A buffet breakfast is served from 7:30am - 10am and the selection is amazing. The dining menu truly impressed me as well as there were quite a variety for both meat eaters and vegetarians alike. My oldest daughter who is a vegetarian truly approved. 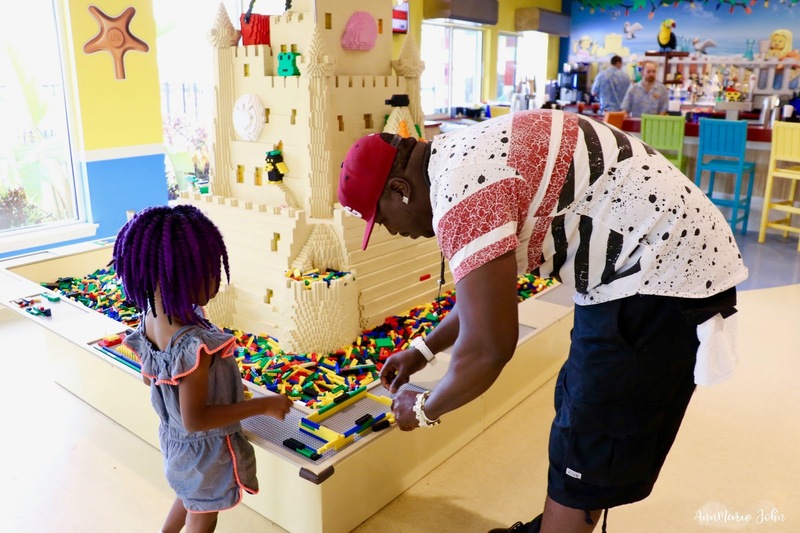 There is fun for everyone, everywhere you turn at the LEGOLAND Beach Retreat. At the Lighthouse where you'll find Sandy’s Castle Restaurant, Bricks Beach Bar and Palm Tree Traders, you'll also find a LEGO building station in the shape of a giant sandcastle, along with thousands of LEGO bricks, there both kids and adults alike can get creative and make their own LEGO creation. 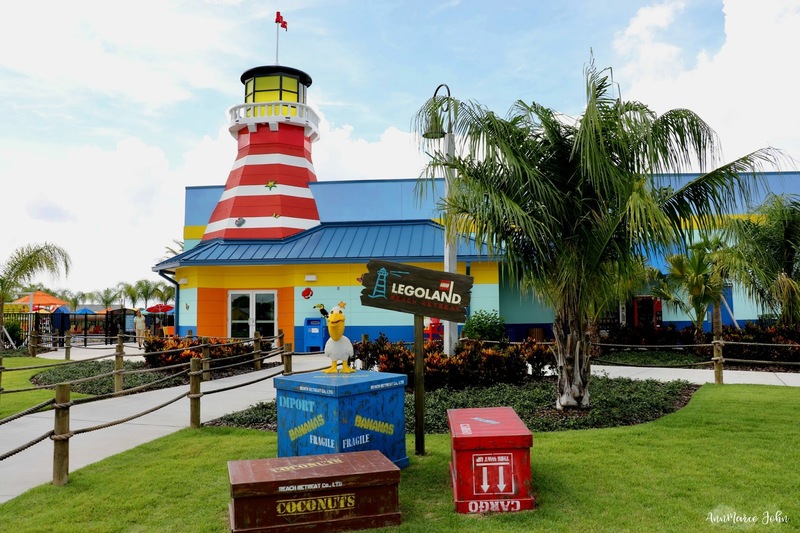 You don't have to leave the LEGOLAND Beach Retreat to get your shopping on. 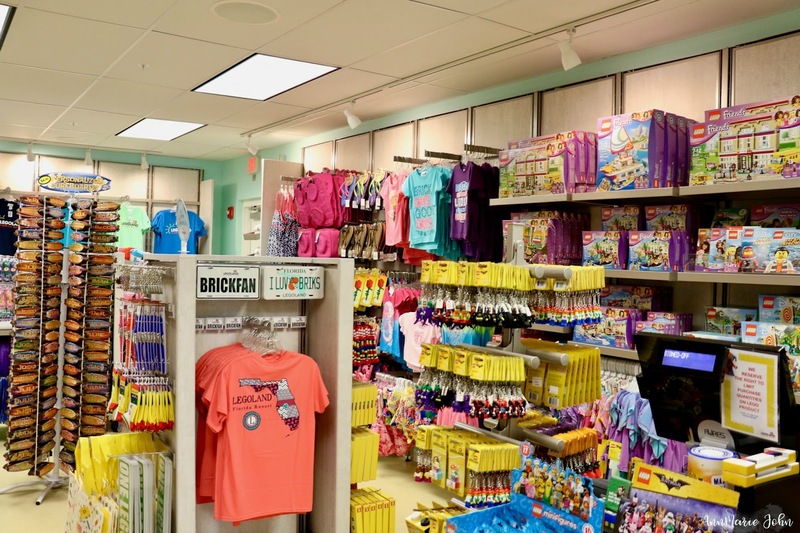 The Palm Tree Traders retail shop, located in the lighthouse, is stocked with LEGO building sets and Minifigures, apparel, toys, swimwear, snacks and much more. 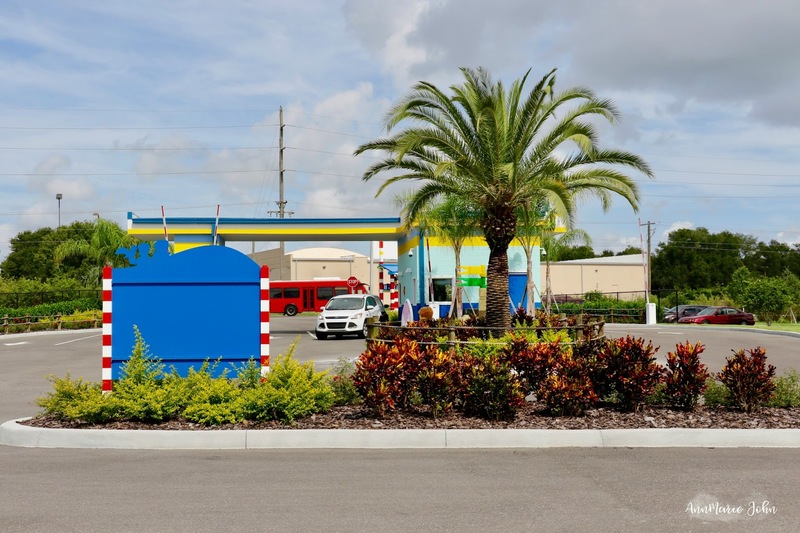 While the LEGOLAND Beach Retreat is not quite far away from the Theme and Water Park, you will have to cross a busy street to get there. However, there is a complimentary shuttle that takes guests to the theme park entrance. 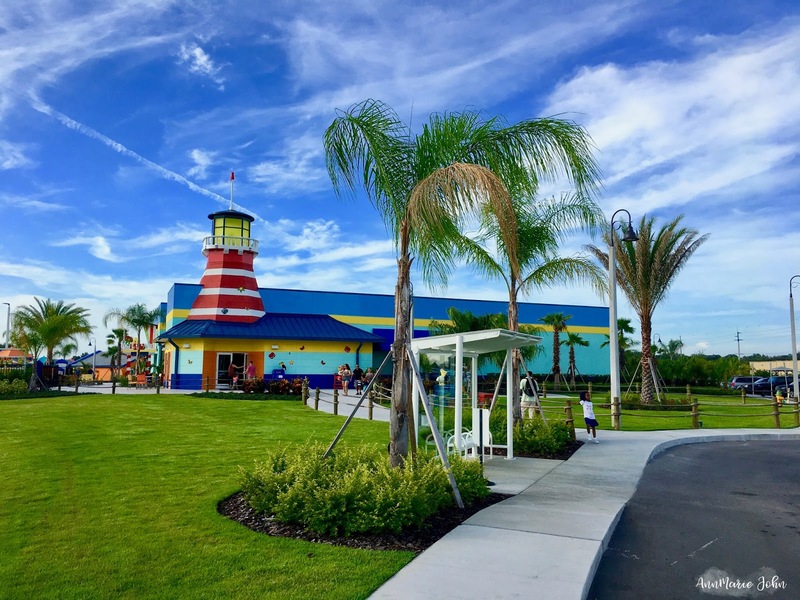 Guests of LEGOLAND Beach Retreat also receive free parking in the main parking lot for those who do choose to drive to the park. Guests also receive early access to the parks. Nightly room rates start at $135 (plus tax and resort fee) and vary by season, date and availability. Packages including theme park tickets also are available, and Awesomer and Awesomest Annual Pass Members receive a 10 percent discount year-round. For more information about visiting the LEGOLAND Beach Retreat, including savings on advance purchase of admission tickets, multi-tier annual passes, special events, educational programs, services for guests with disabilities, VIP experiences, military discounts and much more, visit www.LEGOLAND.com/florida, or call 877-350-5346 daily from 9 a.m. to 5 p.m.
At the LEGOLAND Beach Retreat, EVERYTHING IS AWESOME!! That sounds very similar to the one in California. My kids loved the one in California when we went a few years ago. I love this! It's not just built for kids, it's built for any LEGO love. I've been in love with LEGOs for years. This is the coolest! My kids would love this. We have a LEGOland near us, and the kids love it. We've been several times. I'd love to take them on a LEGO beach retreat. what an amazing place! I know my kids would love this place. will look into it for our next visit. thanks for the tip. Both of my kids are absolutely obsessed with legos. It's the first and last thing they do every day. They would love this place. When they're a little older we'll absolutely plan a trip! This would have been the perfect place for my family to stay when my son was younger! Unfortunately, lately, he's decided that he's too old for Legos :( My husband and I still love them tho! How have I not heard of this place? Sounds like I'll have to plan a vacation there for when my nephews are a bit older! I love that they have life size lego in the pool! I am in love with the fact that you don't even have to leave your car to check-in! That is seriously genius! This looks like such a fun place to stay and I know that my two littles would absolutely have a ball here. Wow, those rates are affordable. As you know, we go to Orlando every winter. Just last night we were talking about aligning our trip when Scarlet's best friend's family goes. They are usually a week behind us! This year, her best friend suggested this resort. I didn't even know about the pool with the Legos! What a dream. You can count on me heading there in January. This just seems like the perfect family vacation! How fun! I'm loving the pool with all of the Lego toys and having the build areas everywhere is awesome! My son would have loved this when he was younger. He was obsessed with all things Lego! Just the other day, my 5 year old was asking to go to Lego Land. May be we will make a trip this December. Lovely post. Thanks you for sharing. Oh this totally sounds like a cool things for family with kids. I am gonna totally share this with my cousin so he can take his four year old. This is just way too cool. My son has been all about LEGOs lately and would freak out at a stay here. We plan to visit my mom in FL early next year, so maybe we can surprise him with an overnight visit. The bungalows look very nice! I love Legos, but since I don't have kids I haven't had the urge to go. Ill definitely be adding this to my bucket list for when I have kids :) Thanks for sharing! Oh boy does the Legoland beach Retreat look so fun! My kids would be in Heaven! Wow! So much to do. I've must plan a trip now. This is adorable! It looks fun for kids and adults--just awesome! My friend has her parents take her kids to Legoland hotel in Carlsbad and they love going every year. It sounds like such a fun trip. And the rooms look very bright and colorful, very nice for the kids. This is the kind of vacation that the kids will love your for. I think EVERYTHING is fantastic and it's worth going to especially if you have kids who'll appreciate the activities (4 years and older), but of course regardless of the age, kids will have a fun time here! This is amazing! Both my daughter and husband would love this resort!! I am definitely adding this to our travel list! My kids have just become obsessed with legos this year and I think they would flip over this! They would have so much fun here! We will definitely have to plan a family trip here. Maybe in 2019 since I want to do a family trip to Florida DW next year. Oh this is so so fun!! I love how bright and playful this place is, my kiddos would love it! My son is still a HUGE Lego fanatic (so is my 27 year old bf) so this would be a perfect trip for us! Heck, I even want to go! This is the perfect family place. 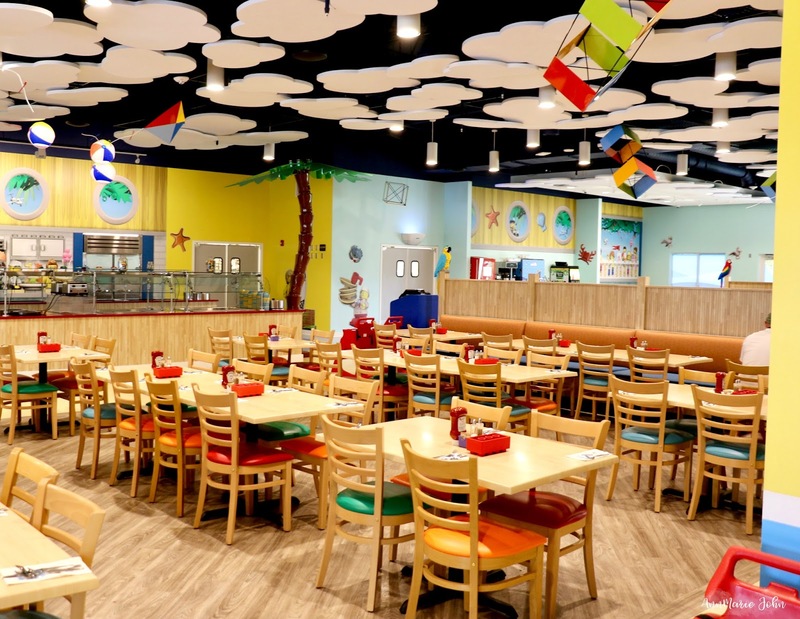 Kids (and kids at heart) will love it here! I wish they had this when my children were still young. I will suggest this to my daughter. She and her husband is looking for a vacation destination that is kid-friendly. 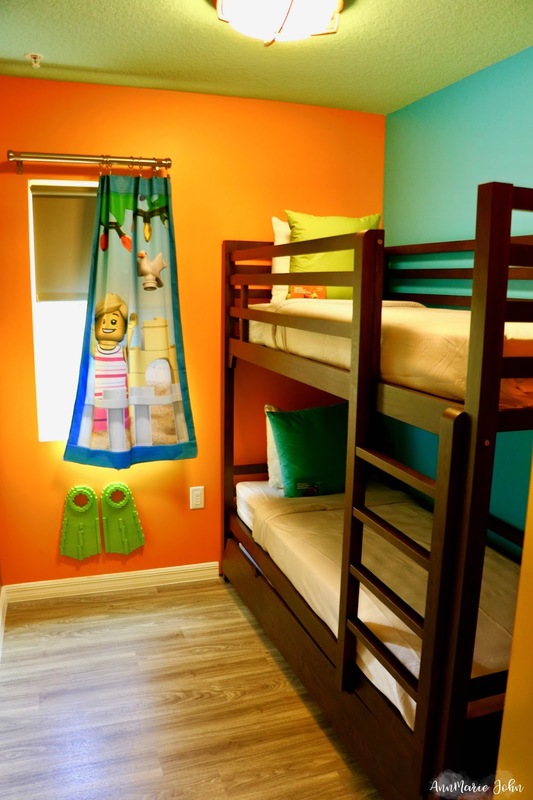 Legoland Beach Retreat has everything they wish for. Thanks for letting me know. I've passed it on the way in to Legoland and wondered how it would be to stay. I can see it would be fabulous. We may still go before school starts. Oh em gee, this looks like a place my family would like to visit! Didn't know such a thing existed! This is too cute! I'm glad Madison had a great time! We've been to Legoland, but never stayed on property! I love how unique and colorful their property is, as well as cool lego designs! Our kids love going to Legoland! This sounds like a blast! I bet they would love it! We'll have to check it out. This looks fab! something my little guy would love, particularly the lego print on the walls and the floating lego bricks in the pool! 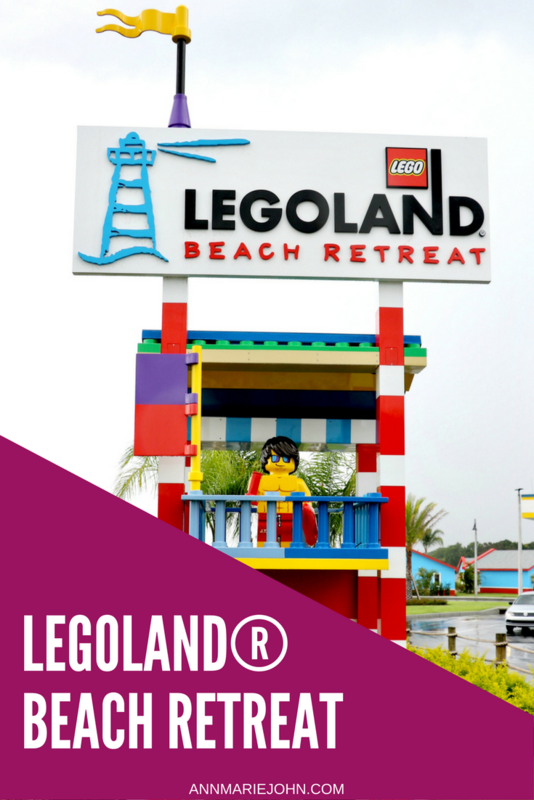 LEGOLAND Beach Retreat seems to have something for the entire family! I love the giant swimming pool with lego toys. This looks so awesome! Where in FL is it? I looked all over the website and couldn't find the location. My kids would love this place! It's in Winter Haven, FL which is about 35-40 minutes from Orlando (Disney World). Well that was about how long it took for us to get there from our resort. I'm too far from LEGOLAND it looks like SO much fun! I'm really hoping I can take my kids there one day I know they will love it! I must get my youngest son to this place one day soon! I know that he would absolutely love it! Legoland is definitely on my list to take my kids to. This just looks like it would be so much fun for kids and adults. Oh my gosh how fun! My nieces and nephews would totally have a blast here! Leyland looks and sounds lik e a great place for families especially for the children. This is amazing. i didnt know Legoland had a beach retreat that is so cool!